Lakeside landscaping aesthetically enhances property and, ideally, complements the natural ecosystem. Use plants native to the area when possible to increase the likelihood of success, and let your budget decide what other structures to include, such as docks, patios or gazebos. Be aware of local restrictions and requirements when planning and developing lakeside landscapes. Determine what growing zones exist along the lakeside where plants will grow. Upland soils that are moist but not wet are suitable for plants like anise hyssop (Agastache foeniculum), butterfly milkweed (Asclepias tuberosa), asters and goldenrod (Solidago). Grow plants such as blue flag iris (Iris vericolor), turk's cap lily (Lilium michiganense) or great blue lobelia (Lobelia siphilltica) in wet meadow areas, which are wet soil zones that are rarely under standing water. 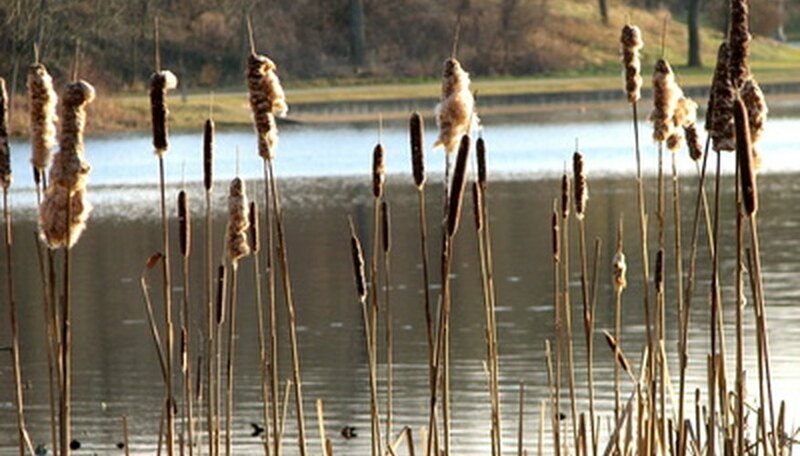 The emergent zone around lakes, containing shallow water most of the time, is suitable for cattails (Typha latifolia) or water plantain (Alisma plantago-aquatica). Submergent zones are aquatic, under water all the time, and are perfect for growing American lotus (Nelumbo lutea) or white water lilies (Nymphaea tuberosa). Some lawn grasses, like Bermuda grass (Cynodon dactylon), are high maintenance grasses, requiring high inputs of fertilizers and pesticides to control insect and disease problems. Consider planting bahia grass (Paspalum notatum) or another appropriate low-input grass in your region to avoid costly maintenance. Excessive fertilizer runoff leads to the growth of algae and unwanted aquatic plants. Choose lawn alternatives in select areas where grass doesn't grow well or is not wanted. Vegetative ground covers are low-growing, spreading plants that often fill in areas quickly with interesting foliage. Be aware of invasive species in your area before establishing a plant with a tendency to take over. Create a lakeside dining space, either with an open patio at the water's edge or a more formal space like a gazebo or pergola. A simple space with a table, chairs, comfortable lounge chairs and other amenities extends living space and encourages outside gatherings. Consider adding a small, portable fireplace like a chiminea for keeping warm in the evening when the lakeside is cool and breezy. University of Minnesota Extension: Native Plants for Lakeside Landscapes. What Types of Grass Seed Will Grow in Sand?